My uncle knows the names of all the mountain ranges and most of the islands that are the mise en scène of this small town on Vancouver Island. “That is the Olympic mountain range. Mount Baker is through there,” he tells me. “That is San Juan Island. And that—” he is squinting toward a dark green rise of land in the Haro Strait, far from us but not as far as the mountains or those heavy grey clouds. When the Chinese started to arrive in Canada in the 1850s, Victoria was the first place they settled. They were no more loved here than they were in San Francisco, yet they were able to hang on and would eventually prosper for the same reason they did farther south: they worked better and harder than anyone else. In many ways, they were treated by citizens and government like lepers, so it is of little surprise that the real lepers who were eventually found among them were not treated with care. The unfortunate men were discovered in a small shack in Victoria’s narrow Chinatown. It was not widely understood at the time that leprosy is not very contagious, and the Chinese were hated anyway, so the smaller of the two D’Arcy islands was quickly designated a leper colony and the men unceremoniously dumped there with supplies. Imagine for a moment that you are in those men’s’ shoes. Let’s say bare feet instead, because leprosy can cause toes to disintegrate. So you are maybe missing some toes along with the rest of the disfigurement that is a hallmark of leprosy. You almost definitely have large sores on your body and you are overcome with fatigue. Now get out there and build yourself a lean-to, because those rains aren’t going to stop just because you have some nerve damage and skin issues. There’s no one to complain to, because everyone’s going through the same thing, and trying to one-up each other gets old really fast. And you can’t stand that guy over there with the permanent frown, but there’s nowhere to go to get away from him. 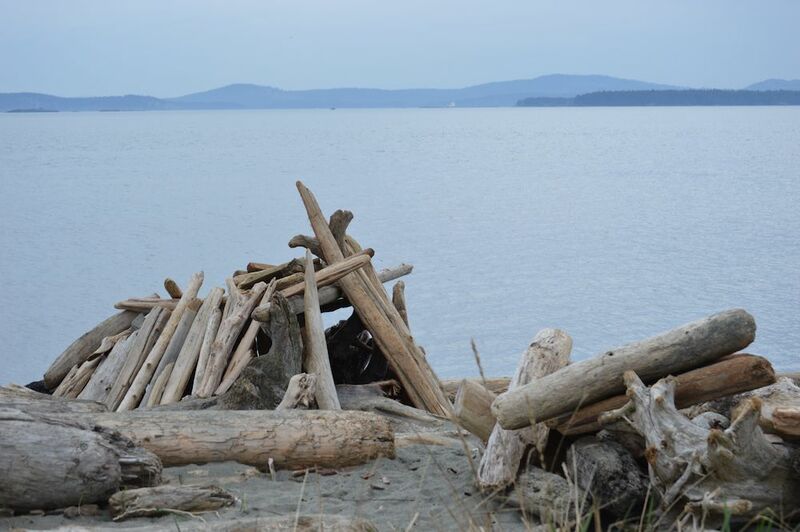 A lean-to on a Sidney-area beach, with D’Arcy dark in the background. It was 1891, and the island would house — if I may use the term “house” — lepers for about 30 years, nearly half of that in subhuman conditions with little medical care. Every three months a boat would drop off supplies, fresh clothes and opium. A doctor would take a quick look, and the men would be alone again. In 1905, things finally started to change. Some funds from the lucrative immigrant head tax were funnelled to D’Arcy Island to start improving conditions. A year later, the Leprosy Act came into being and one year after that the men were repatriated to China and treating facilities were built on the island to treat incoming cases of leprosy. It is believed about 50 men and possibly one woman spent time on D’Arcy Island. In 1924, the final five were transported to the new colony on Bentinck Island and D’Arcy was closed, and mostly forgotten. If you kayak out there now, you’ll find a plaque commemorating their lonely struggles, and you might some artifacts from their lives. You will see mounds where they buried their friends through their own exhaustion and if you’re very quiet and listen to the wind maybe you will hear them crying, and begging to go home. Next Where will they install the statue of you? How do you manage to combine deep compassion with education, with entertainment? I am deeply moved by this story and shocked that I knew nothing about this at all. Do continue what you are doing, your illuminations are precious. Fellow readers, please share this story, especially with young people.